The Souls series and Blood Borne have always been a delight and a nightmare for the gaming audience for a long time now. Unlike other games which guides you thoroughly, all of these titles throw you in an unforgivable corrupted world. You have to figure out everything for yourself, from mechanics to quests. All those unending hours you spend and still, there's always something new to do, these games have made a notorious legacy of challenging difficulty. But now From Software is back with another title, so of course, it's going to be a hard grind if nothing else. The new game is called Sekiro: Shadows die Twice. At Microsoft's E3 2018 conference, From Software surprised the community with a brand new title. A trailer and a gameplay video were shown. For starters, it is a third-person action slash and hack game and many elements from their previous titles were seen in the demo. However, a lot of new exciting features were also seen such as resurrection after death, a new sword arts technique and grappling hook for swift mobility. The combat as seen in the demo is more action-packed and has now new sneaky stealth elements incorporated. Unlike their previous games, the game won't have a difficulty setting as the developers want all the players to experience it at equal levels without any discrimination. However, Director Hidetaka Miyazaki said that Sekiro will probably be, "even more difficult than Souls and Bloodborne". Damn, now this sure is a bad boy to beat. Sekiro: Shadows Die Twice is available for pre-order and will release on March 22, 2019, for PC, PS4 and Xbox. 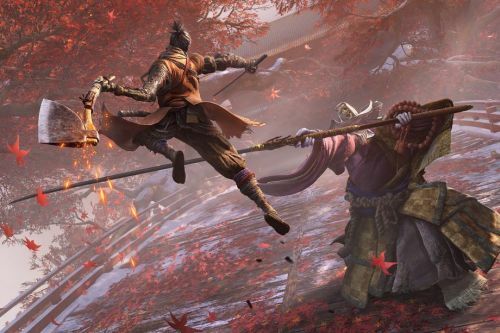 Sekiro: Shadows Die Twice- The game has sold 2 million copies within one week according to Activision. Sekiro: Shadows Die Twice- The game won't be releasing in India.